Here’s a short looping animation, just in time for the Remembrance Day for Lost Species – I’m taking part in a pop-up exhibition tonight at Baumhaus Berlin, organised by Jenni Ottilie Keppler, together with other illustrators, poets and sculptors. 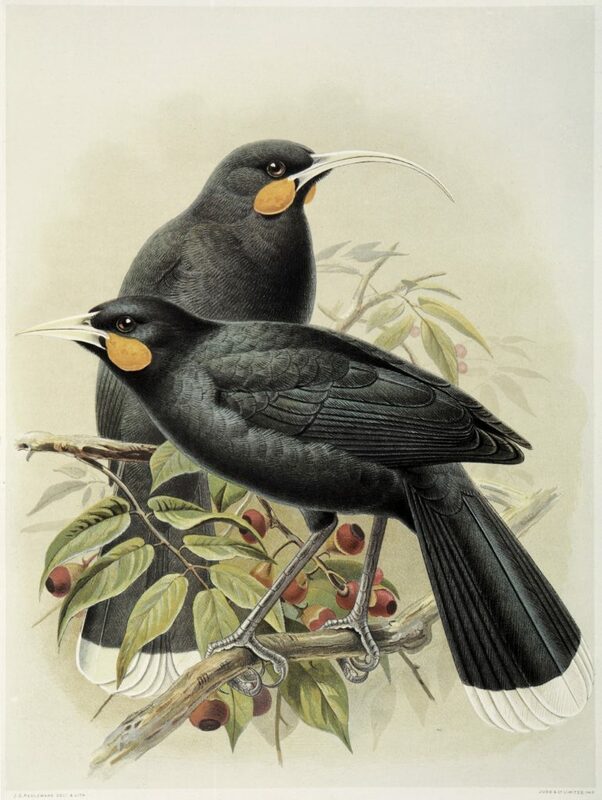 The artist J.G Keulemans’ 1888 illustration of a huia pair appeared as a plate in Walter Buller’s A History of the Birds of New Zealand. His illustrations of native birds have become iconic representations, much reproduced in New Zealand and around the world. Keulemans was based in London and did not travel to New Zealand. Although he had done some work in the field, he mostly worked from stuffed skins – dead specimens, sent to him from around the world. The audible ‘bird calls’ are human imitations, recorded with Henare Hāmana in 1949. As a young man, Hāmana was familiar with the huia and had also been part of an unsuccessful search team in 1909. His whistles are created from 40-year-old memories. This animation that results is also a rather unreliable interpretation, hence the name ‘exquisite corpse‘ – its movement is based merely on videos of the Tieke, a surviving (though endangered) relative of the huia, which I’ve never seen in the wild. — Sir Walter Buller, New Zealand’s well-known 19th-century ornithologist, encapsulating what one source describes as the “ambiguous” 19th-century attitudes towards the declining New Zealand avifauna. The rampant and unsustainable hunting was not just financially motivated: it also had a more philosophical, fatalistic aspect. The conventional wisdom among New Zealand Europeans in the 19th century was that things colonial, whether they were plants, animals or people, were inferior to things European. It was widely assumed that the plants and animals of New Zealand’s forest ecosystems would be quickly replaced by more vigorous and competitive European species. This assumption of inevitable doom led to a conclusion that the conservation of native biota was pointless and futile; Victorian collectors instead focused their efforts on acquiring a good range of specimens before the rare species disappeared altogether. I love to explore the public domain both for understanding our cultural history and for inspiration in my own work (see my snowflake hat project, the recent Arts & Commons workshop, and next week’s DiVersions project in Brussels). I would highly recommend to others to dive in and play around with the wealth of knowledge and culture which we all share. If you just want to browse what’s out there, try the Public Domain Review for a start. If you’re looking for specific Public Domain material to remix, you don’t always find everything on your first web search – it pays to search in a specific online archive (such as the incredible resources from the New York Public Library or the vast Flickr Commons collection) or ask a likely institution for help. In the case of this huia image, Fi from Digital New Zealand and archival superhero Mark Crookston both helped me out via Twitter – though it pays to use the proper resources like DigitalNZ’s search tool first. Note that the huia call audio is not in the public domain. I don’t have permission to use it, and I don’t think that New Zealand or Germany (where I’m based) have a ‘fair use’ protection for cases like this, so I may be asked to remove the audio – I got it from NZ Birds Online, but have since discovered that rights for this work are managed by Ngā Taonga Sound & Vision, whom I have now written to, asking for permission to use the audio. However, I should point out that were it not for the (illegal?) availability of the mp3 for download at NZ Birds Online, I would never have made this animation. The requirement to first ask for permission and explain what you would like to do with a work, before you even know exactly what you will do with it, whether it’s a worthwhile investment of your time and whether you will even finish the project… this is something that shuts down the creative process instantly, putting certain ideas in a ‘not allowed’ or ‘too hard’ category, and means that artworks and interesting cultural projects which could exist, simply do not. The lack of downloads on Ngā Taonga is not a complaint against them, they are doing everything correctly according to the law. But this situation is for me a reinforcement of what makes the public domain such a fantastic resource – you don’t have to ask permission first. You don’t have to have a clear plan, or try to explain something before you do it, if you think it might be a good idea, you can just do it. The public domain itself is gradually becoming a lost species, as copyright term lengths are regularly increased (and spread internationally by trade agreements) while the scope of copyrights, patents and design rights are also extended to new areas. Ngā Taonga Sound & Vision doesn’t own the rights to this recording, but we do act on behalf of the rights holders and have an obligation to ensure that it is re-used ‘appropriately.’ This is obviously subjective, but in broad terms, it means we try to ensure that any re-use of a recording respects the intent of the original creator and the integrity of the recording itself. You will find we have given permission for the huia recording to be used in multiple visual and sound art projects in the past, both in New Zealand and overseas. ‘Huia (exquisite corpse)’ by Sam Muirhead is licensed under the Creative Commons Attribution Sharealike license. This license covers the video only and does not extend to the audio. Made with Krita and Synfig, Animation and source files available here.